As it is named Street 50, how can they not come out with local street food right? Guys, good news for you! Enjoy zhi char in a restaurant at an affordable price! Skeptical about it? Read on! Coffee Wings[$7.90] We usually eat coffee pork rib at coffee shop right? This time, the chef came out with coffee wings! Its good but it would be better if there is stronger coffee taste! 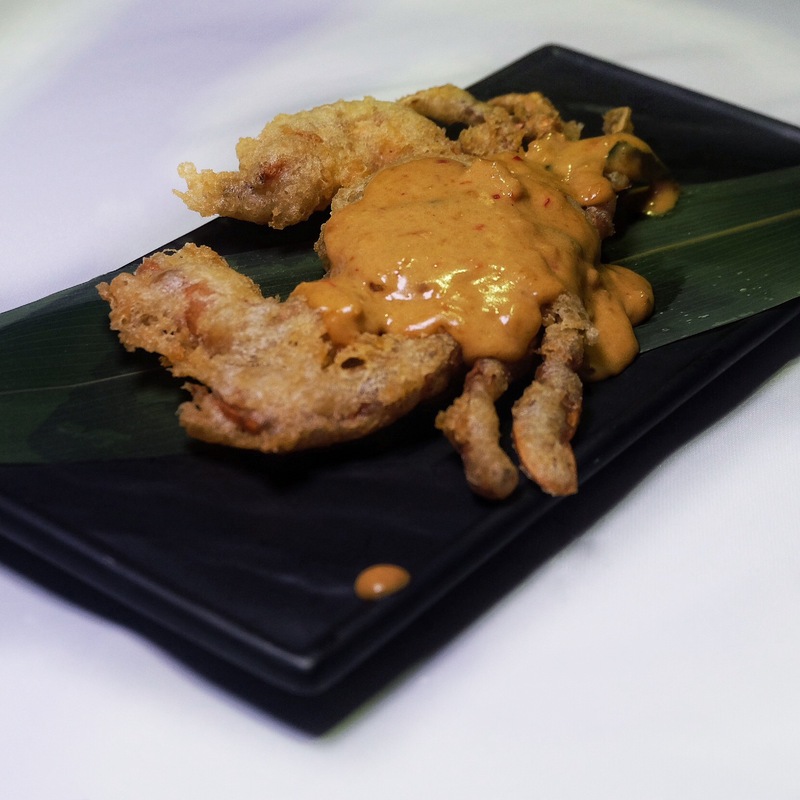 Soft Shell Crab with salted egg dip[$7.90] Now where to find this dish for only $7.90?! The soft shell crab was a little soggy that day but thats probably because we took quite awhile for photo shooting ! The sauce is a little too thick but its tasty. Salted Egg Lava Chicken Breast[$9.90] Must Try! You must be wondering, where is the chicken breast? The creative chef actually used the cordon bleu concept which is a dish of minced breast meat wrapped around cheese, breaded and deep fried. Encased with his homemade salted yolk paste, this is definitely a must try! XO Scallop and Prawns fried rice [$9.90] Using the Japanese style omelette concept, this dish is served the omu style with generous portion of prawns and scallops. Cereal Prawns with Wasabi Dressing [$9.90] Must Try! My Favourite dish of the night! This dish is a little spicy so if you can’t take any chilli, you may want to request for a less spicy one. As it is without the wasabi sauce, the prawns are juicy and tasty! Oyster Char Kway Teow [$12.90] Must Try! Char Kway Teow with cockles is common, how about oysters this time round?I love the texture of the kway teow and of course the big and juicy prawns atop the noodles. I prefer the oyster to be not so well done though. Shrimp and Eggplant Sambal[$8.90] I like how the eggplant is being stir fried with sambal! 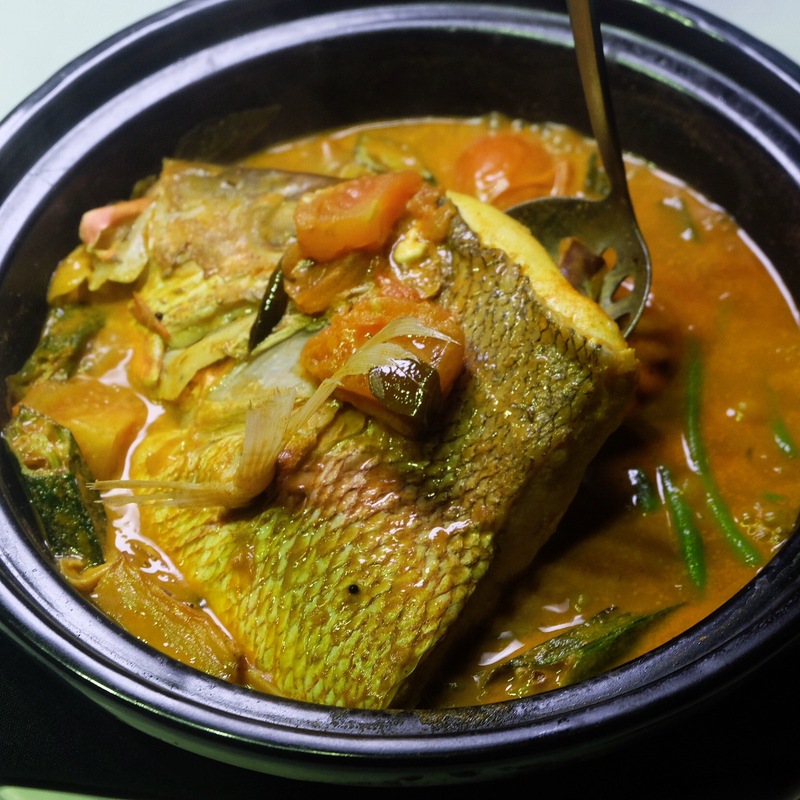 Claypot Assam Fish head[$18.90] Must Try! You would probably expect this dish to be a mixture of spicy sweet and sour, but this is more to the sweet side as they made this a tomato based one. Nonetheless, the sauce is thick and on point. $18.90 for a curry fish head, where to find! Curry Fish Head[$18.90] The first reaction when I tasted this was “any prata to go along?” Curry sauce was thick and tasty but the fishy taste seems to be stronger than the Assam one. Too strong to my liking. Fresh Coconut Malibu [Worth $8.90] Must Try! Guys! This dessert is really good and you can’t miss this! The coconut is not the usual ones which we normally get from any other places! Fresh young coconut fruit with parisienne of mixed fruits, topped with coconut ice cream and served with fresh coconut juice! AND! Spend min $50 at Street 50 and you can get this free!